Approximate running time 3 hrs. 15 min. On the heels of her triumphant Met performances as Tatiana in Eugene Onegin, soprano Anna Netrebko takes on another Tchaikovsky heroine in the first opera of this intriguing double bill, consisting of an enchanting fairy tale (Iolanta) followed by a psychological thriller (Bluebeard’s Castle). Netrebko stars as the beautiful blind girl who experiences love for the first time in Iolanta, while Nadja Michael is the unwitting victim of the diabolical Bluebeard, played by Mikhail Petrenko. Both operas are directed by Mariusz Trelinski, who was inspired by classic noir films of the 1940s. 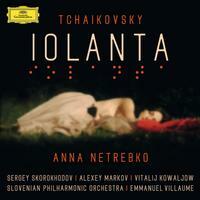 Iolanta also stars Piotr Beczala, and Maestro Valery Gergiev conducts both operas. 2. Moy ptencik, Iolanta, ti ustala? 13. Odnako gde ze mi?